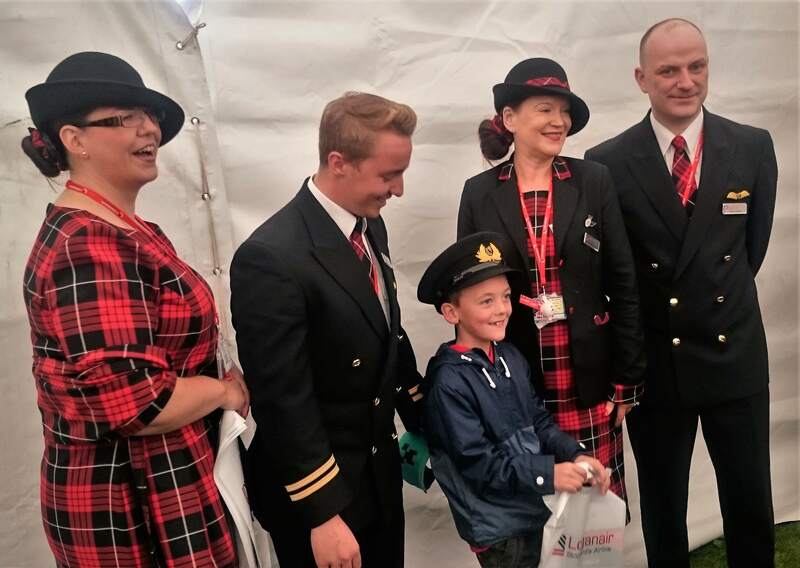 I met Robbie_Cockburn first officer with Loganair at #Scotair17 on Sunday while the rain was making mischief with the flying programme. As I had briefly considered chasing a career with that particular airline back in the day, I was keen to discover what I had been missing, it was only after we chatted for a few minutes that I realised the Robbie was something of a celebrity already in more ways than one. I had always liked the idea of flying into small airfields in interesting locations amid beautiful scenery. 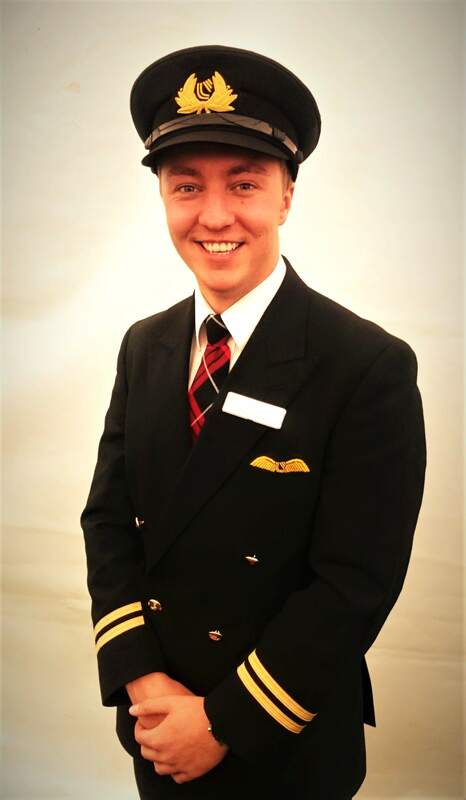 When Robbie told me that he was also the youngest pilot flying with Loganair, I though he would be the ideal man to tell me whether my perception was accurate, happily he agreed to an interview. So Robbie who did you do your training with? I did all of my training in Scotland with ACS aviation in Perth, pretty much full time. I worked as well to help with the financial side of things, it took me two years between 2014 and 2016. The only other external bit of training that I did was the MCC and JOC course which is a requirement to be an airline pilot and I did that in Simtech over in Dublin. After that, just a few weeks after getting my licences back from the CAA, I got a job interview with Loganair. Very shortly after that I was out in Stockholm in Sweden doing my type rating on the Saab 340. What is the MCC, the multi crew licence? The MCC is the requirement to work in a multi crew environment and the JOC is the Jet Orientation Course, it lasts 10 days, certainly the one in Dublin does. It’s as close to a type rating as you will ever do, it is about learning the standard operating procedures, how you communicate properly and how you manage and work with another pilot in a flight deck. How to talk to each other properly and really the logistics of being an airline pilot. Everything before that is about being a single pilot in a single engine or perhaps a light twin. Its about getting the real feel of what it’s like to be an airline pilot. How did that course prepare you, how realistic was it, now that you have actually sat in the cockpit? A lot of pilots think that the MCC/JOC is a tick in the box exercise, a lot of people do view it that way. I think realistically that course was one of the most valuable things I ever did to prepare me for an airline job as that’s the environment that I work in now. It’s second to none for taking you from that single pilot environment to the multi crew. I still use that training in my day to day job, so it’s very, very valuable. It’s really much more than just a tick in a box, it is really one of the most important things in an airline. "Some of the most challenging and rewarding flying we do is around the islands." So when you started training did you have any experience at all? No not really, when I was fourteen I did some trial lessons and some experience flights, just a few flying lessons. Because of my age I took a break, otherwise I’d just be plodding along at like a lesson a month and it wouldn’t be very productive. To do a first solo you have to be sixteen, so while the hours do count, you can’t solo until sixteen so it would have been pointless. Coincidentally some of my first lessons were with an instructor that is one of our Captains now, so when we go flying it’s like being back in the day, it’s great, such good fun. It’s amazing it really is, some of the most fun days at work are with him. So I started at 14, took a break to be realistic and started full time training once I was 17 at Perth. Being Loganair’s youngest pilot, what age did you have to be to get that record? You can get an airline pilot’s licence at 18, I think the youngest airline pilot around the block is about 19. I might not be their youngest ever pilot, but right now and for the last wee while I have been the youngest, which has been great , I get to do all the PR; Lots of newspaper articles, I think it went out into about 20 newspapers and I got to do the news on TV too, yeah it’s been great. Is that something that they picked up on or did you court that? They knew and I kinda knew so I asked our director of flight ops, just kinda nudged them and he said “Yeah, you’ll be hearing from the Daily Mail soon.” That’s exactly what happened, they did a big article. It feels amazing, I don’t quite appreciate that I am the youngest but it’s great, a nice accolade to have. I never play with it at work and say I’m the youngest I just turn up and do the job. So you can’t say I’m only wee leave me alone..?. Yeah that’s right, I can’t do that job, you need to do that one, have you seen how old I am? So yeah I got the job when I was only 20, it’s pretty cool. No slack cut for you eh? Robbie Cockburn and colleagues with young Logan after he impressed in the simulator. So what routes are you on now, do you have set routes or just go where you are told? We have a number of routes so it changes pretty much every month I guess. I’m Glasgow based , prior to that I was up in Aberdeen and our routes up there are slightly different. I’ve got much more variety in Glasgow, a lot more of the western islands like Islay, Benbecula, Stornoway, we go up to Shetland and Orkney quite a lot. More so we go down south a lot now, London Stanstead, Norwich, Manchester, we used to go down to Leeds but that’s kinda stopped at the moment. All over the block actually, it’s quite a variety of routes and some of the most challenging, yet most rewarding flying you can do is around the islands. It can be pretty hairy but a lot of fun, tackling the plane down in some pretty interesting weather. Being at the controls of that machine is a pretty good feeling, pretty phenomenal actually. So how difficult is it then to fly the Saab day to day? The Saab is a real pilot’s aeroplane, it’s not very automatic. We do have autopilot but it’s nothing like the sort you get in an A380 for example. We’ve got the basics, but what really adds to the fun of it is that we fly in weather that the autopilot can’t handle some of the time. We have to cut out of the autopilot and get back to basics and hand fly the aeroplane. It will do exactly what you tell it to do, if we want it to do something it will do it exactly, real stick and rudder flying, it’s great. It’s a really great plane to fly. That will expose any flaws in you I’d imagine as well, if you get a bit of finger trouble going? Of course yes, it keeps us on our toes, doing what we do, it’s a good thing to have. You get some long haul pilots that will do four landings in a month, we can do four in a day. It really is a great thing for keeping current with practical hand flying skill, we have to fly pretty much all the time. The island departures , as much as I can, you fly all the way up to the cruise at 18,000 feet then put in the automatics for a short cruise and you are into the descent again. It’s good to be in control of a machine like that full of passengers. So have you done the beach landing yet? I haven’t no, the beach landing is on the Twin Otter aircraft, not the one that I fly, but it is on my bucket list. We have a staff travel set up where we get to fly a little bit cheaper but at the moment the routes are packed and there are no seats so I will wait until it gets a little bit quieter in the winter before I go over. Watching the guys do what they do and landing it on the beach will be stunning. It’s an interesting time to be with Loganair isn’t it, just having split from Flybe and becoming properly independent again; how is that from inside the company? The vibe in the company is really quite amazing, everyone is so excited and geared up. We have the new tartan livery, the new uniform, I’m wearing the tartan tie at the moment very proudly, the cabin crew have a nice new dress, it really looks amazing. We are really pushing the brand out there, we have been doing this for sixty years, we know what we are up to, we just really need to let people know who we are. It has been masked by Flybe and British airways previously, but we are getting the name out there and it is slowly but surely happening and it will all get there in good time. I love the Twin Otter colour scheme with the Saltire on the tail. Yeah we have two in the Saltire scheme which are government funded. I don’t know the exact logistics of that but they are new Twin Otters that were brought in to promote that scheme. There is a Transport for Scotland sticker on there too. So what does the future hold for you then? I don’t want to get bored with flying an automatic plane around for the rest of my life so I’m going to stick around with Loganair for quite a while yet, get my commands and get some proper experience, flying as a captain in some of the great routes that we have. People often ask what the money is like in the airline industry today, without being too personal about it. You obviously have to invest quite heavily in training, is it easy enough to recover that? Yes my salary keeps me going for sure, the real money, if you are a money chaser, is in the long haul environment and always has been. So one day I might start chasing the money, but there is a balance, you either chase the money or you chase the good flying, for me at the moment I’m all for the good flying. I was a professional performer for six years before I joined Loganair, travelling the world spending six months in the UK and six months in the Middle East and Australia, touring around doing shows as a juggler and magician. That’s how I funded my training actually. Does that come in useful with the cockpit announcements then? I’ve done the Edinburgh festival and told people that I’m actually an airline pilot and no one believes me, until a couple of weeks ago a newspaper article came out saying Loganair pilot has secondary career as a performer. That went viral. What do you make of the easy jet inside the Cockpit programme that is on just now? A bit cringy really, it doesn’t really represent what the airline really is. It’s a bit misogynistic I guess, didn’t shine a good light. I think it was made for the viewings rather than representing the company. It was for either making money or getting good ratings. Thanks Robbie, is there anything else you'd like to add? No not really thanks I need to get back to the team, maybe just my website if that's OK? I have to confess to having something of a soft spot for Loganair, simply because of what they do and how they do it. Robbie pretty much confirmed the impression I had of flying with them, real hands on flying to fascinating locations while serving communities. They undoubtedly help communities flourish and make it easier for people to remain on the islands. Neither the airline or Robbie have paid for links or sponsored content in this article, this is just my way of supporting them and saying thanks for agreeing to the interview. I never did go for my commercial licence as at that time sponsorships were coming to an end and training privately was way beyond my reach financially. Bizarrely, it is actually cheaper now to train than it was in the late eighties, both in real terms and the actual price tag. Opportunities are probably better now too for employment, especially within the UK. I promise to use it only to send you Special offers.